PLANNED AS A CHESTER COUNTY PARKWAY: In 1932, the Regional Planning Federation (the predecessor agency to the Delaware Valley Regional Planning Commission) proposed a parkway system around the Philadelphia area similar to that constructed by Robert Moses. Like the Moses parkways in New York, the four-lane parkways were to feature controlled access, stone-arch bridges, timber lightposts and natural vegetation. The regional plan featured a proposed scenic parkway from Valley Forge south through the Brandywine Valley, roughly along the route of the current US 202 through Chester and Delaware counties. Without a forceful "power broker" such as Moses to direct public works projects in the Delaware Valley, the parkway was never constructed. Two years after the parkway was proposed, a new route designation - US 202 appeared through Chester and Delaware counties. The new US 202, which continued north and east of Valley Forge through Montgomery and Bucks counties, was routed mostly along existing two-lane roads such as West Chester Pike and Dekalb Pike. AN OUTER BELTWAY, PIECE BY PIECE: In 1964, the Pennsylvania Department of Highways proposed a continuous four-lane expressway along the US 202 corridor through Pennsylvania. Stretching "from Delaware to the Delaware (River)," the 59-mile-long, $146 million US 202 Expressway - also called the "Piedmont Expressway" in planning reports - was to serve as the outer beltway for the Philadelphia area. Work began in 1965 in the vicinity of the Schuylkill Expressway (I-76) and US 422 Expressway interchanges in the Valley Forge-King of Prussia area, and one year later, in the vicinity of PA 3 (West Chester Pike) in West Chester. In 1967, Section 200 had opened to traffic, followed by the completion of Section 400 in 1969. Construction then began on Section 300 in Chester County and the western one-third of Section 800 in Bucks County. By 1972, more than 20 miles of four-lane expressway had been completed. However, these newly opened expressway sections of US 202 were the last to be constructed for about three decades. Over the years, continued development and environmental concerns halted the progress of the entire "Delaware to the Delaware" length of the US 202 Expressway. However, in the 1990's, the Pennsylvania Department of Transportation (PennDOT) began to address the following safety and congestion issues along the existing sections of US 202. SECTION 100 - PROVIDING SOME ACCESS CONTROL: From the Pennsylvania-Delaware border north to the beginning of the existing expressway near West Chester, the existing US 202 is a four-lane signalized highway with almost unlimited access. According to the Pennsylvania Department of Transportation (PennDOT), Section 100 carries approximately 45,000 vehicles each day (AADT). In 1989, a study commissioned by the Chester County Planning Commission examined land use, historical and environmental plans along the US 202 corridor. Two years later, PennDOT began its own study of the eight-mile-long corridor. In 2002, more than a decade after studies began, PennDOT presented its draft environmental impact statement before the public. The PennDOT plan for Section 100 proposes a widening of the existing route to six lanes (three in each direction) and grade-separated interchanges at US 1, PA 926 and Matlack Street. Other safety measures include adding a center median, eliminating left turns and providing shoulders. In conjunction with the Delaware Valley Regional Planning Commission (DVRPC), PennDOT will investigate land-use issues and the preservation of cultural and historic sites. However, PennDOT does not plan to convert this section to full freeway standards, and has not acquired any right-of-way for such a project. In the interim, PennDOT resurfaced and repaired US 202 in the vicinity of US 1 in Chadds Ford and Concord townships. These minor improvements were conducted between 1999 and 2001. SECTION 200 AND 300 - WIDENING THE EXISTING EXPRESSWAY: From the beginning of the US 202 Expressway in West Chester north to Tredyffrin Township, PennDOT plans to widen the existing four-lane expressway, which now carries approximately 75,000 vehicles per day, to six lanes by utilizing the existing grass median. The $130 million project will include the construction of new collector-distributor (C/D) roads for the PA 29 (Morehall Road) interchange, construction of new ramps for the PA 401 (Conestoga Road) interchange, and the erection of new bridges to accommodate the additional travel lanes and higher clearances. Planning and engineering for widening the 13 miles of Section 200 and Section 300 is underway, with construction scheduled for the end of this decade. During the late 1990's, PennDOT opened park-and-ride lots at the US 30 and PA 29 interchanges. PennDOT also repaired and resurfaced sections of the US 202 Expressway mainline and interchange ramps. These projects were conducted in preparation for the Section 400 reconstruction to the north. SECTION 400 - A COMPLETE OVERHAUL: The most heavily traveled section along US 202, Section 400 carries approximately 100,000 vehicles per day. Soon after this section of the US 202 Expressway opened, new residential, commercial and industrial development had settled along the route, taxing the capacity of the existing four-lane route. In 1986, PennDOT began the environmental impact process along Section 400. During the early 1990's, PennDOT began preliminary design to widen US 202 to six lanes, replace bridges and reconstruct interchanges from Tredyffrin Township north and east to the vicinity of the King of Prussia Inn. PennDOT received final engineering and environmental design approval from the FHWA in 1996. In late 2002, PennDOT completed the widening of the US 202 Expressway from North Valley Road in Paoli north to Gulph Road in King of Prussia. In conjunction with the widening, which brought total capacity from four to six lanes, PennDOT constructed new bridges at Old Eagle School Road and South Warner Road, and built new sound barriers and drainage improvements. Until the Section 400 project in completed in its entirety in 2003, PennDOT is keeping two through traffic lanes open in each direction. PennDOT rebuilt the interchange between the US 202 Expressway, the Schuylkill Expressway and the Pottstown Expressway (US 422) in Upper Merion Township and Tredyffrin Township. New ramps were built to decrease weaving movements, while new bridges were built to accommodate the widened roadway and new ramps. For several months in early 2001, construction in this area was hampered by emergency work to stabilize sinkholes. In December 2001, a new ramp from northbound US 202 and eastbound US 422 to eastbound I-76 (which occupies the PECO-Penn Central right-of-way, where utilities have been relocated) opened to traffic. During mid-2002, PennDOT opened a new C/D road from southbound US 202 to westbound US 422 and I-76. The remainder of the ramps, retaining walls and other structures were opened in late 2003. PennDOT reconstructed the interchange with Chesterbrook Boulevard in Paoli. In addition to new ramps and bridges, PennDOT extended Chesterbrook Boulevard (which presently ends at US 202) south to PA 252 (Swedesford Road). The historic King of Prussia Inn, which sat in the median of US 202 just north of the Schuylkill Expressway (I-76), was relocated during 2000. PennDOT opened a park-and-ride lot at South Gulph Road, just south of US 202. The $290 million project was 80 percent financed by the Federal government, with the remaining funds coming from state and local governments. After 17 years of planning, and nearly five years of construction, officials opened the rebuilt Section 400 on October 30, 2003 to great fanfare. SECTION 500 - FROM HIGHWAYS TO STREETS: From King of Prussia north to Norristown, US 202 transitions from a four-lane divided arterial highway to two-lane, one-way streets. In the late 1990's, PennDOT oversaw a $3.6 million project to rehabilitate 2.6 miles of arterial highway from South Gulph Road in King of Prussia to the Dannehower Bridge in Bridgeport. Within Norristown Borough, northbound US 202 traffic utilizes (state-owned) Dekalb Street, while southbound US 202 traffic utilizes (local-owned) Markley Street. Recently, PennDOT signed an agreement with Norristown Borough to transfer ownership of Markley Street to the state, in exchange for Airy Street (whose jurisdiction would be transferred from PennDOT to Norristown Borough). Engineering, right-of-way and construction funds for reconstructing US 202 through Norristown have been earmarked on the PennDOT 1997-2008 program. No expressway upgrade has been proposed for Section 500 on the current PennDOT 12-year capital program. More recently, in its 2025 "Long-Range Plan for the Delaware Valley," the Delaware Valley Regional Planning Commission (DVRPC) recommended against additional widening along this section. SECTION 600 - FROM TWO-LANE ROAD TO FIVE-LANE ARTERIAL: Just north of Norristown, the two-lane US 202 traverses an area of medium-to-heavy commercial development, taxing the capacity of the road. In 1990, PennDOT began environmental and engineering studies to improve Section 600, including widening the existing roadway to five lanes (two in each direction, with a continuous left-turn lane). Amendments to the plan included improvements to bus service and new bicycle lanes. In May 2000, PennDOT received a record of decision from the FHWA to build the "selected widening" alternative, in which only certain areas were to receive the five-lane widening. PennDOT began final design studies two months later. Construction along Section 600 began during 2003. No expressway upgrade has been proposed for Section 600 on the current PennDOT 12-year program. The DVRPC also recommended against a controlled-access upgrade to connect to the new "super 2" section of US 202 (Section 700). SECTION 700 - NOW BEING BUILT AS A "SUPER 2" PARKWAY: From Montgomeryville to Doylestown, the existing US 202 serves more than 20,000 vehicles per day. Like along Section 600 to the south, explosive growth in the northern outer suburbs has led to chronic congestion along Section 700 through Montgomery and Bucks counties. As a follow-up to its 1964 proposal, the Pennsylvania Department of Highways conducted location studies for an expressway bypass in 1968. One year later, the DVRPC seconded the recommendations of the state highway department. The new US 202 was to be constructed as a four-lane expressway on new right-of-way from Valley Forge north to the Delaware River. In response, some townships set aside land for the right-of-way of the proposed US 202 Expressway. However, in other towns, the route was met with solid opposition. During the 1980's, the DVRPC revisited the Section 700 issue in two different studies. In a 1983 regional traffic study, the DVRPC recommended the construction of a new US 202 Expressway from the existing US 202 Expressway in Doylestown south to a proposed extension of the Fort Washington Expressway (PA 309) near Lansdale. Combined, the US 202-PA 309 complex was to connect the Doylestown, Montgomeryville and Lansdale areas to the Pennsylvania Turnpike-Delaware River Extension (I-276). In a 1989 corridor study, the agency concluded that the 10.5-mile-long proposed expressway could utilize existing land set aside for the right-of-way, preventing widespread dislocation. Prompted by these studies, PennDOT began preliminary engineering and environmental studies along Section 700 in 1990. By the mid-1990's, PennDOT had shortened the proposed route of the expressway bypass from 10.5 miles to 8.9 miles. The new route, which is proposed to run from just west of PA 63 (Welsh Road) in Lower Gwynedd Township to the Doylestown Bypass (PA 611) in Doylestown, was approved by the FHWA in August 1998, after eight years of studies and public hearings. Through the Section 700 project area, four 12-foot-wide lanes, 12-foot-wide shoulders and a variable median were to be provided. The roadway was to be comprised of 27 bridges, 12 culverts, three miles of retaining walls, and 11.5 miles of sound walls. Grades were to be kept to a maximum of four percent through the rolling hills of the area. The expressway was to have a design speed of 65 MPH and a design capacity of 25,000 vehicles per day. To facilitate commuting, PennDOT was to provide 420 park-and-ride parking spaces, and build a 14-foot-wide pedestrian and bicycle trail north of (and parallel to) the expressway. To build the expressway, PennDOT acquired 261 properties (41 of them in their entirety). Final engineering design is approximately 75 percent complete for the route. PennDOT originally scheduled construction of the $383 million "new alignment alternative" between 2004 and 2007, but all design, right-of-way acquisition and construction work was halted in April 2004, pending evaluation of a "smart-growth" alternative that replaces building the expressway with improving local roads and building roundabouts. THE SECTION 700 PARKWAY: In February 2005, PennDOT presented a $161 million, two-lane ("super 2") parkway alternative for the Section 700 right-of-way. In its study "A Look at New Solutions," PennDOT cited that neither it nor the DVRPC had the budget to justify the four-lane freeway option at the present time. Even on this smaller scale, PennDOT said capacity would be doubled from current levels along this section of US 202. As presented at a February 2007 public hearing, the proposed two-lane US 202 Parkway would have a 40 MPH and have eight-to-ten at-grade intersections. To maintain a bucolic setting, trucks would be banned from the parkway, and a bike path would be built along the right-of-way. 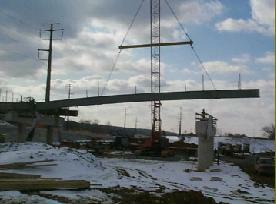 PennDOT broke ground for the relocated US 202 on November 21, 2008, with completion scheduled for December 2011. However, many in the area still believe the at-grade parkway would not solve the chronic congestion that a freeway would help alleviate. UNBUILT THROUGH THE BRANDYWINE VALLEY: For approximately eight miles south of the existing terminus of the US 202 Expressway in West Chester, the US 202 Expressway was to continue south along a new right-of-way west of the existing route. There was to be an interchange with the unbuilt US 1 Expressway in the vicinity of Brandywine Battlefield State Park. Further south, the US 202 Expressway was to extend into Wilmington, providing high-speed access to I-95 and the (unbuilt) DE 141 Expressway. No specific route studies were performed on along what is now Section 100, which surely would have impacted parks and historic sites in the Brandywine Valley. While no right-of-way was purchased along this section in Pennsylvania, right-of-way was set aside north of Wilmington for the unbuilt Delaware section of the US 202 Expressway. EXISTING US 202 ALIGNMENT: Through King of Prussia, the existing four-lane arterial facility was to be upgraded to a controlled-access freeway. The US 202 Expressway was to cross the Dannehower Bridge over the Schuylkill River (opened in 1972), cutting through Norristown Borough and paralleling North Wales Road toward Montgomeryville. PA 363 ALIGNMENT: Instead of cutting through King of Prussia and Norristown, US 202 was to be rerouted onto the US 422 Expressway to the PA 363 (Trooper Road) interchange just north of the Betzwood Bridge over the Schuylkill River. It was to form a loop to the west and north of Norristown, roughly paralleling PA 363 and Germantown Pike (old US 422), and rejoin the US 202 Expressway alignment in the vicinity of the Pennsylvania Turnpike-Northeast Extension (I-476). Because of rapid development and environmental concerns, the US 202 Expressway through Montgomery County remained on hold for years. In 1977, PennDOT withdrew funding for many proposed projects, including Section 500 and Section 600, effectively killing the expressway in this area. UNBUILT THROUGH BUCKS COUNTY: Much of Section 800 through Bucks County, from the terminus of the US 202 Expressway in Doylestown to the Pennsylvania-New Jersey border, remained to be built. The US 202 Expressway was to extend to a new toll bridge constructed by the Delaware River Joint Toll Bridge Commission. A strong path was apparent which satisfied all conditions well… This corridor represents a path in central Bucks County that is most suitable for the location of the expressway by fitting all conditions in the most satisfactory way. From the bridge crossing at New Hope, it passes between Solebury Meeting House and Solebury Village, across the Honey Hollow watershed onto the ridge. Passing north of Mechanicsville, it connects back onto existing Route 202 at Pool's Corner, crosses Route 611 and proceeds southwest below Tradesville to the county line. This corridor follows the path of minimum interference with natural features, built environment, use and activity, while meeting the need for access. In addition, as the corridor follows the high ground at the edge of the ridge from Route 263 to Route 611, it provides the opportunity for views in all directions. Three general recommendations are made for the final design of the expressway. It is strongly urged that a continuous curvilinear alignment be used with a variable median and separated profiles. These design methods provide for the best integration with the landscape and the most visual enjoyment for the motorist. No interchanges were to be built between PA 413 in Mechanicsville and PA 32 in New Hope. This was done to help preserve the rural character along this stretch of the US 202 corridor. When the toll bridge to New Jersey opened in 1971, a temporary road was constructed to connect to the existing US 202 in New Hope, with the provision that an expressway eventually would replace the road. Opponents vigorously fought the highway, fearing that the US 202 Expressway would serve as a truck bypass through the urban Northeast, and that the rural quality in Bucks County would be lost. In 1977, PennDOT withdrew funding for the controversial US 202 Expressway through Bucks County. There are no current plans to resurrect the unbuilt Section 800. A CONTINUOUS US 202 FREEWAY TO CENTRAL NEW JERSEY: PennDOT should revive long-range terms to develop the US 202 corridor as a freeway through the entire length of Montgomery and Bucks counties, and the NJDOT should consider an extension of its existing US 202 Freeway section as far north as I-287. Tolls should be considered to finance this project. SOURCES: Regional Plan of the Philadelphia Tri-State District, Regional Planning Federation (1932); "A Design Decision Program for the Evaluation of the Location of Highway Route 202 in Bucks County, Pennsylvania," Bucks County Planning Commission (1967); "Six-Year Improvement Program (1967-1973)," Pennsylvania Department of Highways (1967); 1985 Regional Transportation Plan, Delaware Valley Regional Planning Commission (1969); "1970-1983 Traffic Trends," Delaware Valley Regional Planning Commission (1983); "Rebuilding US 202 (Section 400) Today for a Better Tomorrow," Pennsylvania Department of Transportation (1997); "US Route 202, Section 700, Montgomery and Bucks Counties, Pennsylvania: Administrative Action Final Environmental Impact Statement and Section 4(f) Statement," Federal Highway Administration and Pennsylvania Department of Transportation (1997); "Route 202: Readying for Pain" by Marilyn Wimp, Philadelphia Business Journal (6/12/1998); "US Route 202, Section 700, Montgomery and Bucks Counties, Pennsylvania: Record of Decision," Federal Highway Administration and Pennsylvania Department of Transportation (1998); "SEPTA Link to Reading Boosted" by Jere Downs, The Philadelphia Inquirer (12/24/2000); "Bypass Work Speeds Ahead" by Mark E. Jolly, The Intelligencer-Record (2/22/2001); "First Came Sinkholes, Next New Jams on the Schuylkill" by Jere Downs, The Philadelphia Inquirer (3/09/2001); "Route 202 Options Up for an Airing" by Susan Weidener, The Philadelphia Inquirer (4/22/2001); "Construction Set To Begin on Route 202" by Brian Rossiter, The Reporter (8/24/2001); "Route 202 Project Comes to an End" by Jere Downs, The Philadelphia Inquirer (10/30/2003); "PennDOT Delays Release of Alternate Route 202 Study" by Jere Downs, The Philadelphia Inquirer (1/19/2005); "Route 202 Plan Falls Short on Support" by Christine Schiavo, The Philadelphia Inquirer (11/07/2005); "Hearing Held on Route 202 Parkway Project" by Bo Koltnow, WFMZ-TV (2/28/2007); Citizens for the Route 202 Bypass Committee; Greater Valley Forge Transportation Management Association; URS Corporation; Chris Blaney; Richard Cuff; Robert V. Droz; Jeff Kitsko; George Kowal; Scott Kozel; Len Pundt; Bill Stephens; William F. Yurasko. US 202 shield by Ralph Herman. US 202 Expressway exit list by Jeff Kitsko.